You are invited to drop by Zeno's Warbird Video Drive-In http://www.zenoswarbirdvideos.com to view our January 2016 selection of eight exciting films streaming over the Web in broadband, including three premieres! * Floating Fortress:" The Battleship Wisconsin in Action NEW! This is a unique look inside an Iowa class battleship, the U.S.S. Wisconsin, during the Korean Conflict. Essentially unchanged from World War 2, the Wisconsin provided fire support for amphibious landings and inland battles, hurling 16 inch shells 20 miles. The Wisconsin was a floating city at work. You'll see all aspects of daily operations including inside the gun turret in action, on the bridge, the fire control center, messes, bakeries, butcher shops, the PX, print shop, the engine room and much more. *World War 2 US Navy Radiomen NEW - Restored Color! See Navy Aviation Radiomen handle communications & repair aboard a Jeep carrier, on a long range bomber and in action in the back seat of a Dauntless Dive Bomber, where they doubled as an observer, navigator and rear gunner! *Target Tokyo: The first B-29 Mission NEW! Follow the men of the 21st Bomber Command and their B-29 Super Fortresses from their training base in Grand Island, Nebraska, to the newly built air base at Saipan and right into the first 3,000 mile raid on Tokyo. Great up close and personal footage of the lives of air & ground crews, along with rare B-29 combat film shot on that first big raid on the Nakajima aircraft plant. *354th Fighter Group Mustang Pioneers. Exclusive production. Rare color film of the legendary 354 Fighter Group, with over 700 Kills, the highest scoring American unit in Europe. You'll see great aces like G.T. Eagleston and B.W. 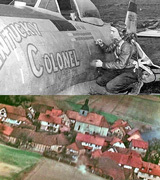 Carr at work and at play in their newly captured base in Germany in Spring, 1945, only a few months before war's end. Nice scenes with the group's well known P-51Ds too, including "Margie Maru" and "Angel's Playmate." This was the first group to fly P-51Bs in the ETO. Amazing color gun camera film! *Introduction to Dive Bombing You'll learn everything from the basic theory of dive bombing to how to put your egg on a real target, including ships at sea. Navy SBD "Dauntless" dive bombers delivered fatal blows against the Japanese carrier force at the battle of Midway using the same techniques you'll see in this film. A must for history buffs and virtual combat pilot's alike.